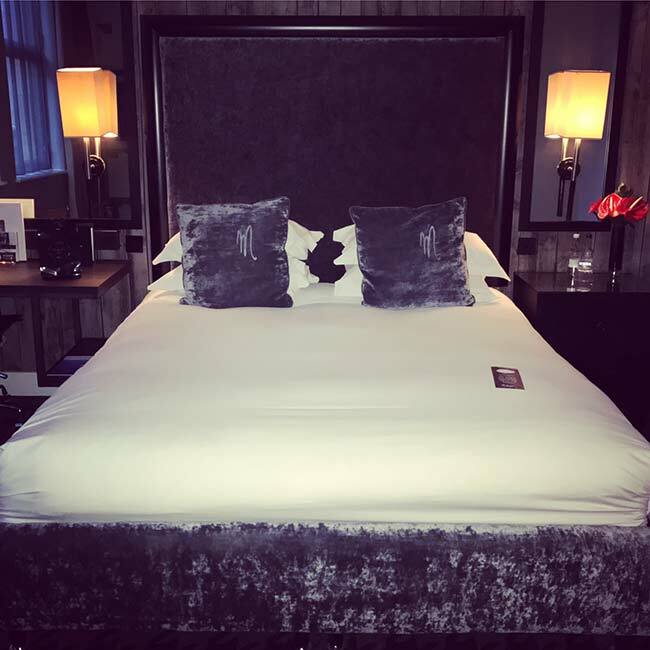 To celebrate my birthday my husband and I decided to have a whirlwind mid week rendezvous in Manchester staying at the sumptuous Malmaison hotel in the heart of the city. I love going to Manchester with its array of restaurants, shops and vibrant bars, its a great place for a quick overnight as it can be reached in about 2 hours from central London and around 1hr 30 mins from most Northern cities . Transformed from an elegant 19th century warehouse, the Malmaison is one of the most stylish hotels in Manchester city centre. Consisting of 167 luxury rooms and 13 suites, its just a stone's throw from King Street and St Ann's Square, not to mention two fairly famous football clubs. The Chez Mal Brasserie is at the heart of the action, where you can order locally sourced and inspired dishes including smoked steaks and delicate, flavoursome fresh fish. Sit back and soak up the atmosphere with a glass of wine or ice cold beer in this red leather-and-neon styled brasserie. With its incredibly comfy, beds and cool, relaxed atmosphere its no wonder that visitors are drawn back to this super stylish boutique hotel. Staying in an extremely sizeable junior suite we were shown to our room after a super swift and efficient check in to be greeted by a lovely birthday card and treats for me including wine, chocolate and Starbucks caramel wafers which I love with a gorgeous hot coffee. Immediately I was made to feel really special! I loved that the hotel had such attention to detail as I always think its those extra touches that can really make your stay, given theres a personal element to your experience. Although we only had 24 hours in the city we still managed to pack quite a lot in with a trip to the spa, dinner at the hotel, followed by drinks at the recently opened Menagerie restaurant and bar. My spa experience was amazing! My therapist was absolutely brilliant as she performed the Espa Specific Facial which is tailor-made to the clients needs. Im normally more of a massage girl but wanted to try something different and I can happily say the facial was just as relaxing as my normal choice of therapy especially the end section which included a blissful Indian head, neck and shoulder massage. After my wonderful treatment, James and I headed to dinner at Chez Mal the fabulous brasserie restaurant within the hotel and what an amazing meal we had. Starting with deliciously delicate tempura prawns and succulent scallops before moving on to the sharing steak platter, we pretty much devoured every bit of the delightful fayre. 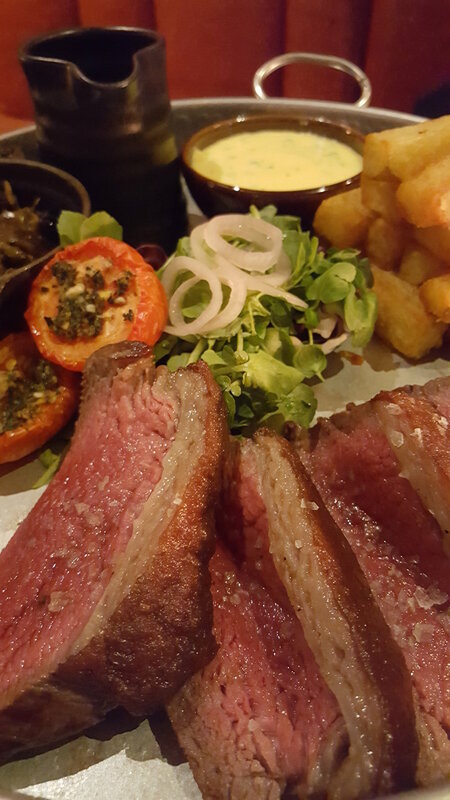 The steak was so tasty and twinned with hearty beer battered chips and béarnaise sauce it was the perfect choice for a typically chilly British evening. Afterwards I was far too full for an actual dessert so decided to opt for an orange creme brûlée martini which was just gorgeous. I’ve decided this is definitely the way forward with dessert, if you’re completely satiated with food opt for the liquid version for all of the gorgeous flavours without the heaviness of an extra course! James however decided to take full advantage of the cappucino ice cream, which again was delicious! After our meal we were super full but decided to visit newly opened Manchester restaurant and bar Menagerie, which again was brilliant. Another thing I love about Manchester is its constant supply of fabulous eateries, when one slightly goes off the boil another pushes its way to the forefront thus giving its citizens a consistent choice of culinary delights! Following drinks and dancing at Menagerie we headed back to the Malmaison to retire into our luxuriously large bed for a fabulous nights sleep before waking (late) and making our way down to breakfast hosted at Chez Mal. Yet again we were treated to excellent service and sumptuous food including eggs benedict and freshly baked croissants and jam, swilled down with gloriously smooth coffee and home made orange juice, it was the perfect send off. With an equally easy checkout as check in experience we left the hotel feeling refreshed, well fed and like we had been away for much longer than one night! We had a brilliant time at the Manchester Malmaison and I can highly recommend the hotel for either a quick overnight or a longer stay in this buzzing and exciting city. To book your stay please visit Malmaison Manchester. Prices start at £95 per night. My husband and I took a trip to the Lake District where we stayed at a beautiful hotel called Brimstone which is part of the Langdale Estate and situated near the Langdale pikes. If anyone is wanting a last minute trip away, I would highly recommend you check this place out as its fantastic. James and I stayed here 3 years ago when Freddie was very little as I didn’t want to be too far away from him on our first trip away without him and we absolutely loved it and our second visit was just as good! Built in the style of an alpine lodge, Brimstone exudes relaxed luxury. From the moment you park the car in an under ground bunker and are then escorted directly to your room (no checking in here) via a gorgeous entrance lobby complete with exposed slate and a roaring wood burning fire you feel like you’ve stepped into a secret hideaway. The rooms at Brimstone are beautifully decorated in muted colours of green, grey and copper accentuating the natural surrounds of the hotel. Each room houses a huge ‘in room’ bath from where you can watch TV or listen to your own personal playlist on the apple docking station whilst bathing in Orla Keily products. Signature rooms offer wood burning fires and mezzanine levels, with all guests benefiting from the gorgeous reading room where you can sample afternoon tea and a selection of fine wines, beers and coffees. It makes for a super relaxed stay! One of my favourite things about Brimstone is the Wainwrights Inn which is a little pub at the end of the main hotel complex which serves traditional gastro pub food and drink however there’s no need for messing around with bills and money as you can just charge everything back to your room. The atmosphere at Wainwrights is great as there’s a real mix of honeymooners, families, walkers and locals and even the odd dog or two who tend to take residence in front of one of the gorgeous roaring fires. I love it! As its part of the Langdale Estate Brimstone also benefits from the use of the spa facilities at the main hotel building which can be so nice after a long day out walking, which James and I did despite the fact we got hailed on, rained on and nearly blown away! Another nice little perk of the hotel is the use of its Berghaus room which houses walking boots, coats, waterproofs, rucksacks and torches all for loan (free of charge) to its guests. It’s such a great addition to the hotel as you know you can pack lightly given that you can borrow all of your walking gear when you get there. All in all I absolutely love this hotel and we had the most lovely relaxing time together without having to travel to far from home. It’s definitely a must for anyone planning a romantic mini break.